Monitor Audio Bronze BX2 5.1 review | What Hi-Fi? We're big fans of Monitor Audio's BX2 standmounters. So we can't pretend we didn't have high hopes for this 5.1 set-up. The standard of build and finish is impressive. The BX2s are as smooth and robust as we remember, and the BX Centre, the BXFX rear speakers and the BXW10 subwoofer don't let the side down. Nicely made and specified though they are, the BXC and BXW10 are par for the price-point course. But you don't often see dual-mode rear speakers at this sort of money: the BXFXs can switch between bipole and dipole configuration, making them ideal for positioning alongside or behind your seated position. This Bronze BX 5.1 package really scores with the seamless unity of its sound. 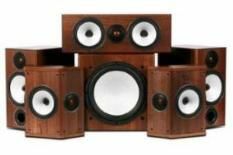 Coherent tonality is to be expected, but the Monitor Audio system generates an open, cogent soundstage and moves effects around it utterly convincingly. The low frequency underpinnings are solidly punchy with little overhang, and dialogue is isolated from and integrated into the whole effectively. There's no shortage of attack available, and sufficient dynamic potency to make you jump out of your seat. It's not quite the last word in detail retrieval, some rivals will bring greater eloquence to dialogue or build even greater dread during quieter, more atmospheric moments. But where spaciousness and unblemished integration are concerned, this is an exceptional package.